Earlier than usual, but I already finished next week’s meal plan, mostly because we already did next week’s shopping today (great feeling to be prepared!). Again, some things from the pantry, fridge and freezer need to be used. We’re slowly approaching the end of our freezer stock (finally! ), and we did not throw away a single piece of fruit or vegetable in the last weeks but managed to use everything before it got bad. Another proof that the meal plan is saving us so much more than time! Today we went shopping part with a list, part with no plan – we had some things on the list to use next week but also spontaneously grabbed some other stuff that I then planned a dinner with. After three weeks of planning before shopping and sticking to the list it was a nice change of just going with the flow! Monday: We will make homemade pasta with Bolognese sauce. I’ll use half a portionnof ground grass-fed beef we got and freeze the rest. A nice trick to stretch the meat portion is to finely chop up some carrots and add to the sauce – they give it a great texture and add some more vegetable goodness! Tuesday: I saw uncured beef hotdogs on sale and just grabbed them, so now they gotta be eaten, so Hot Dogs it is! We also found beautiful heirloom tomatoes which will make a side salad. Wednesday: We have a whole chicken in the freezer that will provide enough meat for three meals. It will be roasted whole with some carrots and potatoes. The leftover meat goes to Friday’s and Saturday’s dinners! Thursday: Some German Schnitzel goodness because there are pork cutlets waiting in the freezer. We’ll have them with mashed potatoes and frozen vegetables. Friday: leftover chicken will be made into a delicious chicken salad that we’ll enjoy with corn muffins. Saturday: The vegetarian dish of the week will be egg fried rice with lots of leftover vegetables thrown in and maybe some sauerkraut that we got today. Sunday: the last pieces of chicken meat and the bones will make the base for a great chicken and corn chowder for the last day of the week! I plan on baking some dinner rolls to go with it. I also noted when to thaw chicken and pork, and that we have to use up some yogurt next week! 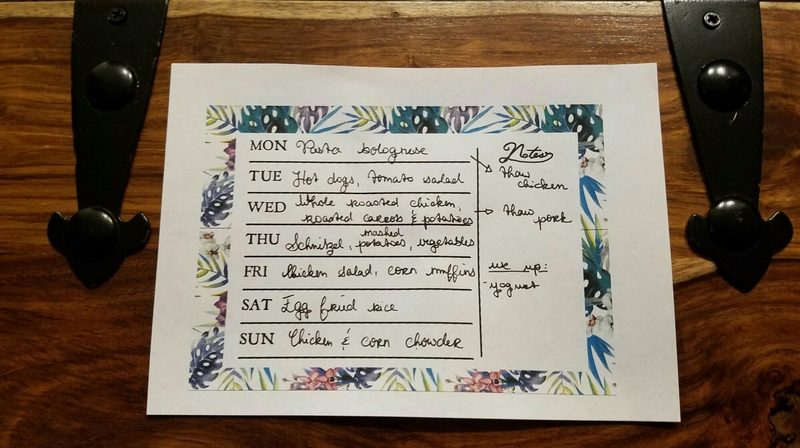 Alright, this is our plan for the dinners of a whole week! I already know I’ll look most forward to the hot dogs, haha! If you want to print out your own meal plan to fill out, you can find it here!